Tongue lesions followed by dyspnea? 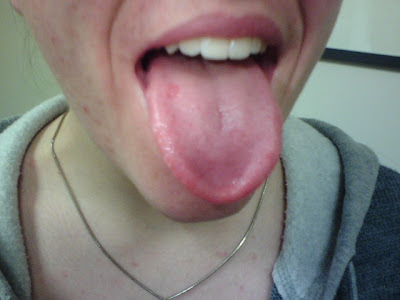 22 year old with recurrent dyspnea, usually preceded by pea-sized painless denuded areas on the tongue (see picture). Episodes of dyspnea have landed her in the ER multiple times, where she's treated with nebs and steroids. No ulcers anywhere else on her body, but she has had some easy bruising lately. Others describe wheezing on exam and I've heard inspiratory stridor during an episode. Normal VC movement on laryngoscopy. PFTs with mild flattening of inspiratory portion of flow-volume loop, otherwise unremarkable. Normal soft tissue film of the neck. Methacholine challenge normal. 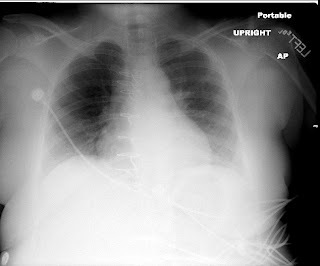 CXR normal. Allergy skin testing negative. IgE 5. TSH normal. CRP 0.4. Liver and kidney function normal. U/A normal. CBC with diff normal. Also had an unexplained episode of weight loss last fall, approx. 20 lbs. Resolved spontaneously and weight came back. I'm temped to call this VC dysfunction, but other docs claim definite peripheral wheezing on exam, and these tongue lesions don't ring any bells. Where is Waldo (or the line)? As ICU co-directors we get to see some unusual situations. This line was reportedly a "little traumatic" going in and there is no good blood return from any of the ports. I enlarged the segment of interest and crudely followed the trajectory. Where is the line going? From one of our readers. Edited a slight bit. Found your site and thought I‘d run some of this by you to get your take on the situation so we might be more well-equipped to talk to our local doctors. Other meds: folic acid, indomethacin, prednisone 30 mg, QD, and hydrochlorthiazide (12.5 mg, daily). February 2005, he started feeling “full” in his torso. Blood tests were “normal”. But he gained 9 pounds in a day. In the ER he was fpund to have fluid around his heart and in his pleural cavity. They withdrew 31 ounces of fluid off the heart. All seemed well....for a time. Had another bout with all this in March, 2005. Around Christmas 2005, he started feeling full again, and the doctor said go to the Emergency Room. Hubby said he didn’t want to go through all that again, so they told him to take prednisone (40 mg a day). Gave him relief. Started to step-down the dosage of prednisone...got down to 10mg/day, and started feeling full, again. Findings: Standard and high resolution chest CT images demonstrate moderate centrilobular and paraseptal emphysema. No focal consolidating process. 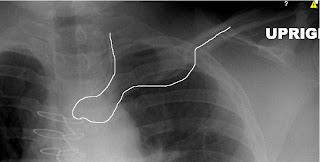 Mild ground glass with traction bronchiectasis involving the peripheral aspect of the lung fields, with upper lung zone predominance. The findings are nonspecific, and may represent sequela of chronic hypersensitive pneumonotis. There is evidence of prior granulomatous disease. There is a 5-mm hyperdense pulmonary nodule in the right upper lobe; this nodule may be partially calcified. There is also an 8-mm, not obviously calcified nodule in the right middle lobe. Small left and trace right pleural effusions are noted. There is no lymphadenopathy. The heart is not enlarged. There is not significant pericardial effusion. The adrenal glands are not enlarged. There is a focal 3-cm mass lesion involving the pancreatic tail. The lesion demonstrates slightly higher attenuation relative to the remaining pancreatic parenchyma. Central low attenuation is noted, suggestive of cystic components. No significant surrounding inflammation is identified. There is not pancreatic ductal dilatation. I have been reading as much as I can to try and understand what this means. Originally, when I started research, I had not began with the idea that all of these are tied to his rheumatoid arthritis; however, the more I read, a correlation seems to be drawn between many of these conditions and either rheumatoid arthritis, or prolonged exposure to methotrexate. I had read one of the posts on the pulmonaryroundtable.com site title BAL eosinophilia in a patient with rheumatoid arthritis which seemed to resemble some of my husband’s case. I wanted to ask what you thought of these results and to see if you thought that my supposition / correlations drawn in my own mind are simply that (suppositions on my part), or if you think that these links are founded, possible, and real. A 70 year old man has reactive airways dysfunction syndrome from a previous inhalant. He was seen in 2005 for dyspnea but primary did not initiate any steroids. At that time his fev1 was 2.05, 66% predicted. When we saw him in January where there was obstruction with an FEV1 of 2.34 (72% predicted). 20 mg of steroids were given (higher doses resulted in his fingers "locking") and a repeat spiro this month shows no change in the obstruction (2.27 l, 69% predicted). How many would continue the steroids? How many would stop the steroids for apparent lack of efficacy? Symptomatically he has mild dyspnea with exertion that is less than prior to the steroids. This comes to us from "IS"
After a R heart cath confirms pulm HTN and a vasodilator test with IV Flolan or inhaled NO confirms a responder, what do you guys start with? Do you start with calcium channel blocker sustained release or short acting? Do you leave the right heart cath in and monitor the hemodynamics as you titrate the dose of CCB? Just wondering as we are trying to start a PH program here and it seems that there isn't a standardized protocol. Thanks for your input. 49yo Hx of ETOH and presumptive cirrhosis. Exposed to birds through his early years. 2000 had abnormal CT thorax with interlobular septal thickening, Pleural thickening encasing the lungs and multiple adenopathy in the med. Mediatinoscopy report says multiple venous collaterals may be early SVC.Thickened fat through the mediastinum.Bx of LN neg,no Cx sent. 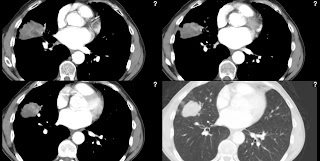 2003 - Same CT findings. Now presents with hypoxia and CT findings similar as before. The radiologist describes that the mediatinum looks abnormal with strading. I think this guy probably has histo with some fibrosis of the medistinum. I wonder if he has compression of the thoracic duct with causing his lymphatics to be prominent and show like interlobular septal thickening on CT and he had previous Chylo?. I was going to do broncoscopy with TBBX and TBNA and serologies. Any other idea or opinion about this case. Do you think I should further investigate the possible thoracic duct obstruction? This is a 67 y/o male with a 75 p/y Hx of TOB but still good lung function (his FEV1 is 2.06L). 2 years ago he was told he had a "quarter-sized" nodule on his RML (at a different facility so I don't have those films) and he decided not to show up for his scheduled Bx or further follow-up visits. The lesion has clearly grown and I'd be surprised if it is anything other than a malignancy. Does the time of "follow-up" with growth but no spread in 2 years change your w/up sequence? For example, if the PET shows no other disease, would you consider going straight to resection without a Bx? case comments: This is just a question: Are most of you still routinely performing a right heart catheterization prior to treatment initiation in patients with pulmonary hypertension - even in those associated with collagen vascular disease, etc? What do you use as your drug of choice for vasodilatory testing? Do you routinely perform a left heart cath as well? Yesterday I got consulted on this 63 y/o woman with abdominal sepsis: she had been on chronic prednisone for SLE and presented with perforated colon diverticuli with peritonitis. She has developed mild renal failure (creat up to 2.4 from 1.5), resp. failure (PaO2/FiO2 ~80) and is still requiring pressors after VERY vigorous fluid replacement. She had good post-op hemostasis and platelets around 100K. In addition to the usual care (ABTx, vent, etc). We started her on Xigris. ~8 hours into it her platelets dropped to ~10K. We held the Xigris and this am they are 26K. Would you continue to hold it, monitor and resume it, transfuse platelets and resume it or just forget about Xigris in her? Well, the press-release was today so it is public info: the phase 3 trial testing IFN-gamma vs. placebo in patients with IPF has been discontinued. The independent data monitoring committee did an interim analysis and found no difference between IFN-gamma and placebo for mortality (14.5% in the Actimmune group as compared to 12.7% in the placebo). The adverse reactions were consistent with prior clinical experience(constitutional symptoms, neutropenia and possibly pneumonia). “The interim results of the INSPIRE trial and our decision to discontinue the trial are disappointing,” said Steve Porter, M.D., Ph.D., Chief Medical Officer at InterMune. To me, this is not so surprising, but it really does illustrate the importance of being careful not to read too much into sub group analysis before the next study is done- the original study found that patients with more "mild" IPF (FVC 55-90% predicted) might have a survival advantage and the current study was powered to test that hypothesis. Ultimately it was found not to be the case after all. Does anyone have any patients enrolled int his trial? Our hospital is looking into updating the bronch equipment. We have tested the Pentax and the Olympus equiment and are waiting for bids. What equipment do you use at your facility? What has your experience been with either (or both)?